When a Minneapolis-based sales and service company added Microboards disc publishers to its line of disc recording equipment, it had no idea the decision would transform its business. Techware Distribution went from selling and servicing CD and DVD duplication machines to burning and professionally printing on CDs and DVDs for its customers. 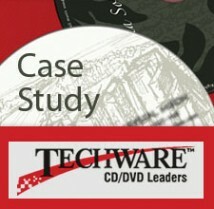 CD and DVD duplication was a relatively new technology when Techware got into the business, so sales cycles were long and involved. Customers had to go through an approval process to qualify to purchase the machines. Before long, potential buyers began asking Techware to burn their discs while they waited to receive their own disc publishers. “When people started asking us if we could help them make recordings, a light bulb went on,” said Gabrik. Techware bought the Microboards Print Factory machines (now called PF-1s) in 2002 and business skyrocketed. Individuals and manufacturers flocked to Techware for its reliable, high-quality, low-cost disc printing services. With HP thermal inkjet technology, images print clearly and precisely—so CDs and DVDs get rich, full-color and full-coverage printing. Separate C, M, Y and K cartridges allow for safe and clean installation with little downtime for replacements. And because they are designed for maximum ink efficiency, the Microboards machines offer a low-cost printing solution. In addition to their low cost and high efficiency, the machines—each with an input capacity of 100 discs—allow users to print runs unattended. Gabrik trusts the equipment to deliver discs overnight. “We know we can leave work and come back to 1,000 or more top-quality discs the next morning,” he said. Microboards’ award-winning CD/ DVD tower duplicators and printers are among the fastest on the market, which means fast turnarounds are now Techware’s specialty. And with the high resolution and low-cost printing that HP technology gives Microboards machines, Techware’s fast runs also show off exceptional quality. From sports highlights to music videos, Techware burns and copies more than 800 discs in one hour and 10,000 in one day. Because Techware can duplicate discs at such high volumes, businesses rely on the company to help them produce high-quality training materials, presentations and marketing videos in record time. “Literally, people can come in and drop off their master artwork, grab a cup of coffee, and we do it while they wait,” said Gabrik. Last December, Techware gave itself a Christmas bonus when it added a new Microboards PF Pro automated disc printer. Using the same reliable, high-quality HP thermal inkjet technology as the PF-1s, the new PF Pro also prints at up to 4800 dpi for crisp, vibrant images. Plus, the HP technology inside allows duplication for as little as 9 cents per disc. Lightning speed, sharp images and low cost. The qualities that drove Techware to sell Microboards machines steered the company to also deliver the products the machines produce. Today, Techware has close to 30 Microboards machines—enough to meet its customers’ needs—and business continues to accelerate. Techware Distribution, Inc (www.techwaredist.com), based in Minneapolis, MN, is a leading supplier of optical disk storage— Magneto Optical Disks, CD, DVD and Blu-Ray discs. Techware also provides MO Drive repair, Tape Drive repair, CD / DVD printer and duplicator repair, new and used DVD / CD duplication and printing equipment sales as well as CD / DVD printing and duplication service, supplies and packaging. A recognized leader in the industry, Microboards Technology has been providing customers with the latest in disc technology since 1989. Offering a broad selection of innovative, cutting-edge products and solutions from both leading manufacturers and its own line of high-quality disc publishing and printing solutions, Microboards is also renowned for superior service and technical support. The company is headquartered in Chanhassen, Minnesota, with a manufacturing facility in Salida, California and global offices in Japan and the United Kingdom.